A few years ago, I asked myself, "Just what type of rider has it historically taken to be a top level long course triathlete?" When I sat down to find the answer, it lead me on a journey that ultimately lead to writing the book, Triathlon 2.0: Data Driven Performance Training. The goal was to see what the data says the performance requirements are to be at the highest level. This eventually led me to wondering what the different levels of performance requirements were for different genders, ages and goals, thus the book. The elites I gathered information on, I wanted to know what their FTP was on the bike, (bFTP), and what their w/kg @ FTP was. I even took some non-long course triathletes to see how they compared. I always wondered if there was a power profile for triathletes, that could be created, like Coggan had created for cyclists. It became clear it wasn't that simple, as the population of triathletes is much more diverse than cyclists in terms of strengths/weaknesses, but that w/kg @ FTP still matters. So I am going to share some of the items from my book in the coming posts, which help show what the level of the sport is for Ironman triathletes, from age group males and females to elites. But before I share the age-group power profiles, I will share the elite profiles. Some of these are from publicly available information, such as power files, blogs, websites, and more. Some of these are estimates, but based on many known variables, so I am confident they are very close. (Even those that are estimated are only a few.) This table is a few years old, but I haven't shared it until now, so it could have some changes, especially in the accomplishments category. It's also possible athletes could have lost or gained more mass, and even raised or lowered their FTP. For example, it is quite possible and believable based on Tim O'Donnell's 2015 performances that his numbers on this chart have improved. This was really just a snapshot in time, but a good picture of what it takes to perform at the highest levels. 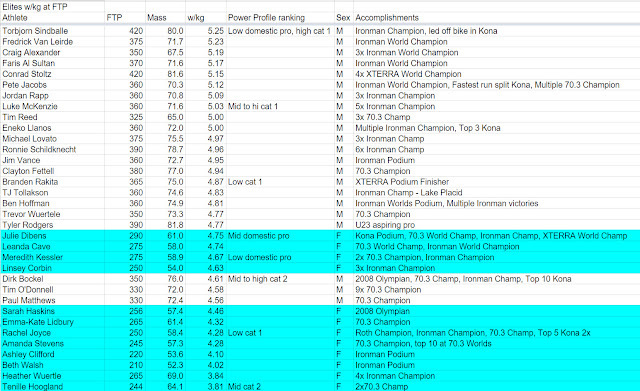 The Power Profile Ranking would be where the athlete would rank on Coggan's power profile as a cyclist. I didn't list each athlete's ranking, just highlighted a few thresholds where the categories changed or were most important. 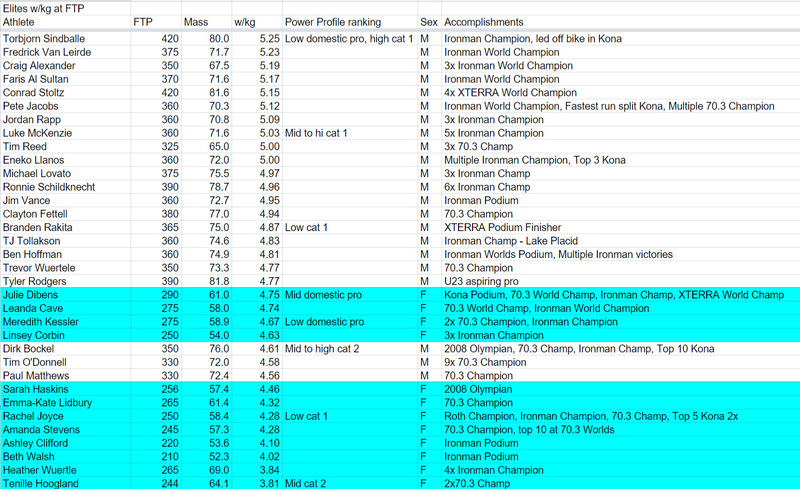 You'll notice I also included women, highlighted in blue, and some of them have better w/kg values than the men. This shows how some of the top women are very competitive, sometimes even against the men. What does this chart mean for you? If you're looking to compare yourself against the best, you now have a barometer to measure against. Is it all about w/kg @ FTP? Not necessarily, as it depends on the course. If the course is flat to rolling, maximal FTP relative to aerodynamic drag matters most, but this drag value won't vary significantly would be my guess, making max FTP the most important. If the course is extremely hilly, w/kg matters much more. But notice the amount of wins, podiums, etc, and the prestige of the accomplishments are concentrated near the top. Want to get better? Raise your w/kg @ FTP. Anyway, the point was to share this type of information and data with the triathlon community. If this is the type of stuff you love, to measure yourself and use data, I am pretty sure you'll love my book. Enjoy, and good luck in your training and racing! Hi- you reference age group watts per kilogram profiles but I Can't find them even in your book which I purchased. Have you published them anywhere?